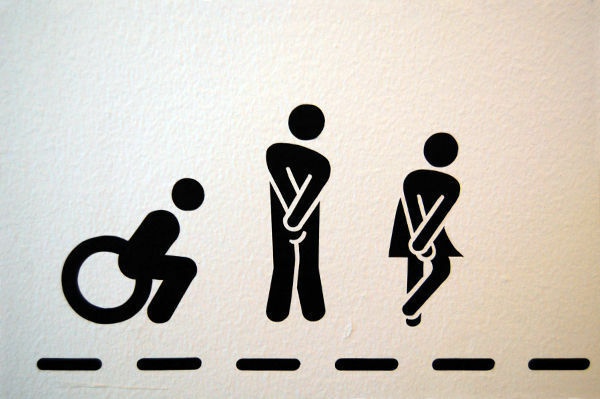 When traveling, use restrooms when you can, instead of waiting till you have to. Parisian “pissoirs” have been replaced by self-disinfecting toilets. Foreign toilets can be traumatic, even in Europe, but they are one of those little things that can make travel so much more interesting than staying at home — every world traveler has one or two great toilet stories that give "going local" a very real meaning. Sometimes the toilet itself is free, but an attendant in the corner sells sheets of toilet paper. Most common is the tip dish by the entry — the local equivalent of about 50 cents is plenty. Caution: Many attendants leave only bills and too-big coins in the tray to bewilder the full-bladdered tourist. The keepers of Europe's public toilets have earned a reputation for crabbiness. You'd be crabby, too, if you lived under the street in a room full of public toilets. Humor them, understand them, and carry some change so you can leave them a coin or two. The female attendants who seem to inhabit Europe's WCs are a popular topic of conversation among Yankee males. Sooner or later you'll be minding your own business at the urinal, and the lady will bring you your change or sweep under your feet. Yes, it is distracting, but you'll just have to get used to it — she has. Some European bathrooms have shared hand-washing facilities for women and men, with adjacent but separate toilet areas. And some restrooms make no distinctions for gender at all. The vast majority of European toilets are similar to our own. But in a few out-of-the-way places, you might find one that consists simply of porcelain footprints and a squat-and-aim hole. If faced with a squat toilet, remember: Those of us who need a throne to sit on are in the minority. Throughout the world, most humans sit on their haunches and nothing more. Sometimes called "Turkish toilets," these are more commonly found in, well, Turkey. Getting comfortable in foreign restrooms takes a little adjusting, but that's travel. When in Rome, do as the Romans do — and before you know it, you'll be Euro-peein'. I once dropped a tour group off in a town for a potty stop, and when I picked them up 20 minutes later, none had found relief. Locating a decent public toilet can be frustrating. But with a few tips, you can sniff out a biffy in a jiffy. 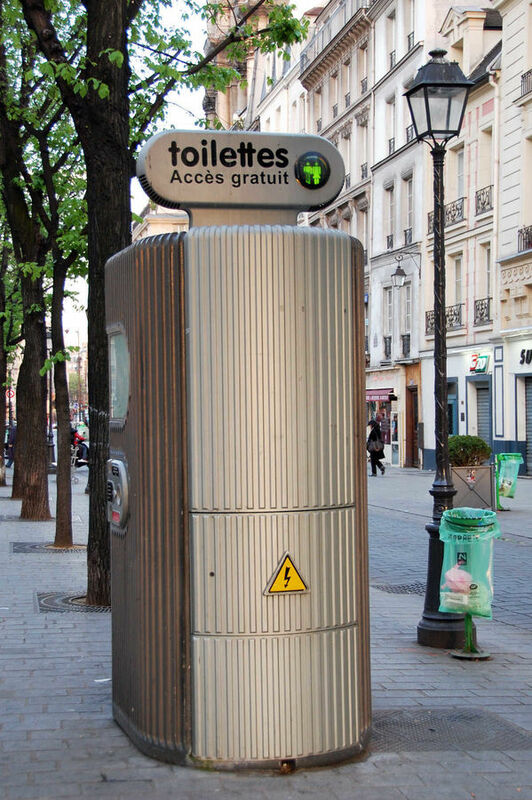 Some large cities, such as Paris, London, and Amsterdam, are dotted with coin-operated, telephone-booth-type WCs on street corners. Insert a coin, the door opens, and you have 15 minutes of toilet use accompanied by Sinatra Muzak. When you leave, the entire chamber disinfects itself. Some cities have free, low-tech public urinals (called pissoirs) that offer just enough privacy for men to find relief…sometimes with a view. Munich had outdoor urinals until the 1972 Olympics and then decided to beautify the city by doing away with them. What about the people's needs? There's a law in Munich: Any place serving beer must admit the public (whether they're customers or not) to use the toilets. Any place that serves food or drinks has a restroom. No restaurateur would label his WC so those on the street can see, but you can walk into nearly any restaurant or café, politely and confidently, and find a bathroom. Assume it's somewhere in the back, either upstairs or downstairs. It's easiest in large places that have outdoor seating — waiters will think you're a customer just making a quick trip inside. Some call it rude; I call it survival. If you feel like it, ask permission. Just smile, "Toilet?" I'm rarely turned down. American-type fast-food places are very common and usually have a decent and fairly accessible "public" restroom. Timid people buy a drink they don't want in order to use the bathroom, but that's generally unnecessary (although sometimes the secret bathroom door code is printed only on your receipt). Even at American chains, be prepared for bathroom culture shock. At a big Starbucks in Bern, Switzerland, I opened the door to find an extremely blue space. It took me a minute to realize that the blue lights made it impossible for junkies to find their veins. When nature beckons and there's no restaurant or bar handy, look in train stations, government buildings, libraries, large bookstores, and upper floors of department stores. Parks often have restrooms, sometimes of the gag-a-maggot variety. Never leave a museum without taking advantage of its restrooms — they're free, clean, and decorated with artistic graffiti. Sometimes you can access a museum's restrooms from the entry hall, without paying to go inside. Large, classy, old hotel lobbies are as impressive as many palaces you'll pay to see. You can always find a royal retreat here, and plenty of soft TP.